Or in other words, they are lumping together costs associated with climate change due to human action, costs associated with climate change from other causes, and costs associated with extreme climate events, whether or not due to climate change. In recent decades, changes in climate have caused impacts on natural and human systems on all continents and across the oceans. ... Evidence of climate change impacts is strongest and most comprehensive for natural systems. ... See supplementary Table SPM.A1 for descriptions of the impacts (B) Average rates of change in distribution (km per d ecade) for marine taxonomic groups ... . Positive distribution changes are consistent with warming (moving into previously cooler waters, generally poleward). "Impacts" sounds scary, but, as the quote shows, only means change. While only a few recent species extinctions have been attributed as yet to climate change (high confidence), natural global climate change at rates slower than current anthropogenic climate change caused significant ecosystem shifts and species extinctions during the past millions of years. Warnings about large numbers of species being driven to extinction by anthropogenic climate change have morphed into the observation that species have gone extinct in the past for reasons unrelated to human action. Some low-lying developing countries and small island states are expected to face very high impacts that, in some cases, could have associated damage and adaptation costs of several percentage points of GDP. Compare costs of "several percentage points of GDP" in the places most at risk due to sea level rise with past rhetoric of hundreds of millions of climate refugees, drowned island chains, and the like. Wheat yields have increased approximately linearly since the mid-twentieth century across the globe, but stagnation of these trends has now been suggested for several nations. .... With the major exception of India, the majority of leveling in wheat yields occurs within developed nations—including the United Kingdom, France and Germany—whose policies appear to have disincentivized yield increases relative to other objectives. The effects of climate change and of yields nearing their maximum potential may also be important. So what has actually happened is not that yields have decreased but that in some areas they have stopped increasing, at least in part due to changes in agricultural policy. At present the world-wide burden of human ill-health from climate change is relatively small compared with effects of other stressors and is not well quantified. However, there has been increased heat-related mortality and decreased cold-related mortality in some regions as a result of warming ... . The first sentence makes it sound as though climate change is making things worse. The second implies that there have been both costs and benefits and offers no estimate of their relative size. People who are socially, economically, culturally, politically, institutionally, or otherwise marginalized are especially vulnerable to climate change. One might conclude that keeping poor people poor, for instance by pressuring poor countries to produce less energy or produce it in more expensive ways in order to hold down CO2 output, will do more damage than good. Impacts from recent climate-related extremes, such as heat waves, droughts, floods, cyclones, and wildfires, reveal significant vulnerability and exposure of some ecosystems and many human systems to current climate variability. Note that the extremes are not limited to those due to climate change. Floods, cyclones, et. al. do damage...and always have. Emphasis mine. If farmers ignore the implications of climate change on what crops they should grow how and continue to ignore them for the next sixty years or so, output is expected to decline. I have not yet gotten into the full report but, judging from accounts I have seen, 2°C of additional warming is about what it suggests we can expect by 2100 if we don't do much to prevent it. So if policies to prevent warming reduce the annual growth rate of world income from (say) 2% to 1.98%, the resulting loss will just about cancel the gain. Not a compelling argument for switching from fossil fuels to solar power. All of these quotes are from the first half of the summary for policy makers—I have not yet tried to get into the full report. My conclusion is that the IPCC's estimates of the negative effects of climate change due to human action are much smaller than the rhetoric surrounding the subject suggests, a fact the report attempts to conceal as best it can by its presentation. And a fact that does not come through in news stories about the report, at least those I have so far looked at. How long before the more enthusiastic true believers start accusing the IPCC of having sold out to the oil industry? Suppose you believe, as many people do, that climate change due to anthropogenic CO2 is a serious problem. There are two different ways you might try to deal with it. One is by trying to keep it from happening, or at least to slow it. The other is by adapting to it. There are at least two respects in which the latter approach is superior to the former. The first is that it avoids the public good problem. If the U.S. switches to more expensive sources of power in order to hold down CO2 output, any benefit from reduced warming is shared with the rest of the world. It is unlikely to happen unless either the benefit is so much larger than the cost that it is worth doing for the U.S. share alone or many countries manage to coordinate their policies, despite the obvious temptation for each to free ride on the efforts of the others. Neither is impossible, both are difficult. Adaptation does not face that problem. If Bangladesh deals with sea level rise by diking its coast, the benefit goes to Bangladesh, not to the U.S. or China. If a farmer deals with an increase in temperature by shifting to a crop better suited to the new conditions, he gets the benefit. The second advantage of adaptation is that it affects only the negative consequences of climate change. While the public discussion often obscures the fact, there are positive consequences as well—indeed, it is not clear that the net effect is negative, especially at low levels of warming. Milder winters are, on the whole, a good thing. So are longer growing seasons. So is an expansion of the habitable area of the northern hemisphere, due to temperature contours shifting north. A reduction in warming eliminates the good consequences as well as the bad. Adaptation can target only the bad consequences. Neither of these proves that adaptation is superior—that depends on the costs of adaptation, the costs imposed by warming, the benefits imposed by warming, the costs of reducing warming. But both are arguments in favor of adaptation. As I mentioned some time back, I plan to be at a conference in Xiamen, China, on May 17th and 18th. If I am going to go that far I'm not going to limit myself to two days, so I have been planning out other stops, hopefully with talks. My current plan is to spend about two weeks away from home. Given the time spent flying, that leaves about twelve days for visiting places. Other than Xiamen itself, the two most likely stops are Seoul and Hong Kong. If I do only those three, that gives me about four days in each. If anyone is interested in setting up a talk in any of those places, or somewhere else en route such as Taiwan, Shanghai, or possibly as far as Singapore, let me know either by a comment here with your email address or by an email to me (ddfr@daviddfriedman.com). I don't think fitting Australia in is going to be practical this trip, although it would be fun. Of the 4,014 abstracts that expressed a position on the issue of human-induced climate change, Cook et al. (2013) found that over 97 % endorsed the view that the Earth is warming up and human emissions of greenhouse gases are the main cause. Cook et al. (2013) found that over 97 % endorsed the view that the Earth is warming up and human emissions of greenhouse gases are the main cause. I agree entirely with the OP's assertion of checking what writers say and see what their statements are based on. In this case, Friedman's criticism is based on misrepresentation of my original text. I find it extraordinary that Friedman accuses me of a deliberate lie while misquoting my work (deliberately? You decide). It is also ironic that a theme of this post is checking writing for falsehoods while uncritically repeating his misrepresentation. That would be a legitimate response if my criticism had been of the fact that his 97% figure ignored the roughly two-thirds of papers that took no position on AGW. But, as anyone reading this can easily check from my earlier post, that is not what I objected to. My objection was that the 97% figure lumped together categories 1-3, when only category 1 fitted Cook's "main cause." Categories 2 and 3 were papers saying or implying that human action was a cause—"contributed to" in the language of the example. Category 1 contained 64 papers, or 1.6%, not 97%. So Cook has indignantly responded to a criticism I did not make, ignored the criticism I did make, and offered a defense entirely irrelevant to the criticism I made. Which leaves me with a puzzle—is he a rogue or a fool? Is he trying to mislead careless readers who, by the time they have gotten to his response, have forgotten what my criticism was? Or is he so incapable of reading and understanding criticism that he confused the point about the two thirds who expressed no opinion, raised by David Henderson in his piece commenting on mine, with my argument—which David Henderson accurately reported? Is he somehow unaware of the trick he himself pulled by pooling the three categories and reporting only the sum? It seems hard to believe. One piece of evidence in favor of the rogue theory is that he did not post his response here, as one comment following his suggested. On the other hand, one piece of evidence in favor of the alternative is that he offered a transparently fraudulent rebuttal to my argument instead of remaining prudently silent. Which suggests that he thought his response was a legitimate one. The obvious answer is in order to annex it, as he has done. The question is not about end but about means. Invading with military force, holding a referendum under the guns of Russian troops, and announcing a result reminiscent of the results of Soviet "elections," has consequences that one would think Putin would prefer to avoid. My guess is that economic sanctions will not hurt him very much. The major costs have to do with the responses of other powers, in particular European powers. The two obvious ones are to reduce their dependence on Russian gas, which will reduce Russia's income from selling it, and to strengthen their military to be better able to respond to any future aggression. The alternative, assuming that a sizable majority of the population of the Crimea wanted to become Russian, would have been to push for a referendum under Ukrainian rule with outside observers and win it. At that point, if the Ukraine refused to accept the outcome, Putin would have had a much stronger case for military action, if not in international law, which recognizes no general right of secession, at least in international politics and public opinion. 1. He did not believe the Ukraine would be willing to hold such a referendum. 2. He was playing to a domestic audience, establishing his image as a forceful defender of Russians and Russian influence. 3. He plans to follow up by further aggression against the Ukraine, perhaps conditional on the western reaction to the first step. If the final alternative is correct, it is hard to see any plausible response other than to permit him to defeat the Ukrainian military and replace the Ukrainian government and/or annex additional Ukrainian territory, or to support the Ukrainian military with European and U.S. troops. Neither looks very attractive. I believe the opposite of what the sixteen claim to be true: dissident voices and new theories are encouraged because they are critical to sharpening our analysis. I have no expertise in climate science but I have spent my life in academia. To judge by my experience, he is describing how it should work but not how it does work. Academics have three ways of gaining income and status in their profession. One is by being hired by a university, preferably a top university, preferably with tenure. A second is by publishing articles in journals, preferably top journals. A third is by publishing original work that the rest of their profession finds convincing. What are the implications for each of being a dissident, someone who rejects the current orthodoxy in one's field? Hiring and promotion decisions are made by the senior faculty members, who mostly subscribe to the orthodoxy—that, after all, is what it means for a view to be orthodoxy. From the standpoint of the people deciding the dissident's fate, he is someone who has rejected truth in favor of error—not a job qualification. If sufficiently able he may overcome that handicap by persuading them that he is brilliant, technically able, unusually hard working. But it will not be easy. Much the same applies to the second route to success. The articles he submits will be reviewed by other people in his field. They too are likely to subscribe to the orthodoxy he rejects. Here again, the situation is not hopeless. If an article is sufficiently brilliant, the reviewer may conclude that it is worth publishing even if wrong. He may even be convinced that it is right. But that is not the way to bet. Most of us are more open minded in theory than in practice. It is only with regard to the third route that being a dissident can be an advantage. Work that supports what everyone else already believes may get you hired and published, but work that offers convincing arguments against the accepted view and for an alternative attracts more attention, not all of it hostile. It may make you the leader of a new school of thought within your field. It may even win you a Nobel prize. In order to achieve that sort of success, however, you have to get your work published. It also helps if you are offering your arguments from the pulpit provided by a tenured position at a top university. Those are conditions that the dissident may have trouble satisfying. I am not arguing that new views can never replace old—obviously they sometimes do. But the situation as I have observed it is the precise opposite of the rosy picture offered by Nordhaus. So much for theory—what about evidence? In an earlier post, I offered an example of how dissident views are treated in practice, a prominent university that pushed out three different academics, two of them economists, because of their unconventional views—views for which all three later received Nobel prizes. In the case of the economists we know it was deliberate because the document saying so, written by the department chairman responsible, was carelessly passed on to a later chairman with different views. For a second piece of evidence, I offer a story. It comes from Leo Rosten, an author who was a friend of my parents. It probably dates from sometime in the late fifties or early sixties. One one occasion, Leo asked an MIT economist about minimum wage laws and got the conventional answer—that they reduce employment opportunities for unskilled workers by pushing up the cost of hiring them. He asked if that was the view of most economists and was told that it was. He asked why, in that case, economists did not make an effort to inform the public of the problem. "I guess we're afraid of sounding as if we agree with Milton Friedman." I cannot prove that the story is true, but after fifty some years in academia from freshman on it strikes me as a good deal more plausible than Professor Nordhaus' rosy view. In the piece I discussed in my previous post, responding to a WSJ article critical of the current global warming orthodoxy, William Nordhaus attacks the idea that climate scientists are under pressure not to take positions skeptical of global warming. He begins by making fun of the comparison to the enforcement of orthodoxy under Stalin. While it is true that the piece he is criticizing made that comparison, its actual argument was that dissenting scientists "are afraid to speak up for fear of not being promoted—or worse… ." Pointing out that "No skeptics have been arrested or banished to gulags or the modern equivalents of Siberia" does not answer that. Nor does observing that "the dissenting authors are at the world’s greatest universities." As Nordhaus is surely aware, firing tenured professors is difficult. Failing to hire or to promote is much easier. Furthermore, his list of universities at which the scientists who signed the WSJ piece are employed ignores the fact that most of them are not in climate science, making it irrelevant to the argument he is offering—a fact Nordhaus surely knows, but most readers of his piece probably do not. His conclusion: "I believe the opposite of what the sixteen claim to be true: dissident voices and new theories are encouraged because they are critical to sharpening our analysis." His argument in support of that claim I find unpersuasive, but that does not imply that the claim itself is false. The piece he is criticizing, after all, offered no evidence in favor of its claim in the opposite direction. Nordhaus himself, however, provides some—not in words but in deeds. The claim of the critics is summed up in the title of their article: "No Need to Panic About Global Warming: There's no compelling scientific argument for drastic action to 'decarbonize' the world's economy." The claim of those on the other side is the opposite—that global warming poses a severe threat to human welfare and drastic action is needed to slow it. Which side of that argument does Nordhaus' own research, as reported in his article, support? The answer is clear. He finds that the net cost of waiting fifty years instead of taking the optimal actions now is $4.1 trillion dollars. Spread out over the rest of the century, that comes to about $48 billion/year, or about .06% of current world GNP. Which position is that closer to, that there is a need to panic and take drastic action or that there is not? And yet, when Nordhaus publishes an article in the New York Review of Books, a very high profile publication, it is an attack on the critics, not an attack on those who, according to his own research, vastly exaggerate the scale of the problem and the need for immediate, drastic action. A central idea of economics is revealed preference—we judge people by what they do, not by what they say. In response he offers a graph of global temperature and writes: "We do not need any complicated statistical analysis to see that temperatures are rising, and furthermore that they are higher in the last decade than they were in earlier decades"
We do not need any complicated analysis to see that temperatures have risen over the period 1900 to the present—but the piece he is attacking doesn't say they didn't. It says that they have not been rising for more than ten years—which, so far as one can tell from the graph, is true. He is attacking them for the offense of making a true claim on the grounds that a claim they did not make is false. It is no doubt true that, among those critical of AGW, there are at least a few who deny that warming has occurred at all. But Nordhaus has explicitly limited himself to the claims in a particular article, and that is not one of them. He goes on to criticize the WSJ article's attack on the IPCC models—specifically, its claim that "computer models have greatly exaggerated how much warming additional CO2 can cause." Unfortunately, his rebuttal never responds to that criticism. He writes, for all I know correctly, that "the projections of climate models are consistent with recorded temperature trends over recent decades only if human impacts are included." That is a statement about the ability of models to fit past data, not about whether models fitted to past data did or did not successfully predict temperatures thereafter. The distinction between the ability of a theory to fit past data and its ability to predict data not used in building it is something one would expect an economist to be familiar with. In economics, a pollutant is a form of negative externality—that is, a byproduct of economic activity that causes damages to innocent bystanders. The question here is whether emissions of CO2 and other greenhouse gases will cause net damages, now and in the future. This question has been studied extensively. The most recent thorough survey by the leading scholar in this field, Richard Tol, finds a wide range of damages, particularly if warming is greater than 2 degrees Centigrade. Major areas of concern are sea-level rise, more intense hurricanes, losses of species and ecosystems, acidification of the oceans, as well as threats to the natural and cultural heritage of the planet. The critical point here is the concept of net damages. That CO2 increase causes damages is not sufficient to make it a pollutant in the economic sense, since it also produces benefits. Neither Nordhaus, Tol, nor I knows what the sign of the sum is, since it depends on unknown future events. As Nordhaus and others have made clear, negative effects become more serious at higher temperatures. The IPCC projections include a range of temperatures, over some of which net effects might well be positive. I have linked in the past to a piece by Chris Landsea suggesting that a very small increase in force of hurricanes will be combined with a somewhat larger decrease in frequency, in which case that effect also might be positive. I have discussed in past posts here other positive effects and my reasons for thinking that they might well outweigh the negative at levels of temperature increase suggested by the IPCC models. Nordhaus goes on to make some arguments about the controversy itself—that it is not biased in various ways against skeptics—that I find neither convincing nor terribly interesting. My research shows that there are indeed substantial net benefits from acting now rather than waiting fifty years. A look at Table 5-1 in my study A Question of Balance (2008) shows that the cost of waiting fifty years to begin reducing CO2 emissions is $2.3 trillion in 2005 prices. If we bring that number to today’s economy and prices, the loss from waiting is $4.1 trillion. Wars have been started over smaller sums. What he does not mention is that his $4.1 trillion is a cost summed over the entire globe and the rest of the century. Put in annual terms, that comes to about $48 billion a year, a less impressive number. Current world GNP is about $85 trillion/year. So the annual net cost of waiting, on Nordhaus's own numbers, is about one twentieth of one percent of world GNP. Not precisely a catastrophe. I suggest a simple experiment. Let Nordhaus write a piece explicitly arguing that the net cost of waiting is about .06% of world GNP and see whether it is more popular with the supporters or the critics of his position. I predict that at least one supporter will accuse him of having sold out to big oil. That aside, is his conclusion that we ought to have a carbon tax correct? In a world of certainty run by benevolent philosopher kings, the fact that a policy has even a relatively modest benefit is a good argument for it, but we do not live in such a world. In practice, policies aimed at reducing warming will be designed not by William Nordhaus but by political actors subject to political incentives. For a sample of what that is likely to produce, I suggest looking at the cap and trade bill that passed the House a few years ago but did not make it through the Senate. The farther the policies are from optimal, the higher the costs and the lower the net benefits. Even aside from that very serious problem, we do not live in a world of certainty. Fifty years from now it may turn out that warming has been much less than the IPCC projected due to technological changes that lower the cost of solar or nuclear power below that of power from fossil fuels, sharply reducing CO2 output. It may turn out that warming has followed the projected path, but costs have not—that the increased droughts, hurricanes, etc. have not appeared. It may turn out that benefits from longer growing seasons, milder winters, CO2 fertilization of agriculture, expansion northward of habitable land area, turn out to be larger than in Nordhaus's calculations. It may turn out that progress in other technologies has provided us with easy and inexpensive ways of modifying either the CO2 content of the atmosphere or global temperature. The future is very much too uncertain to have confidence in estimates of what will be happening fifty years from now—for an extended demonstration, see my Future Imperfect. If we follow Nordhaus's current advice and tax carbon now in order to slow warming, it may turn out that the costs were unnecessary or even counterproductive. We may be spending money in order to make ourselves poorer, not richer. I conclude, on the basis of Nordhaus's own figures and without taking account of my past criticism of his calculations, that he has his conclusion backwards. The sensible strategy is to take no actions whose justification depends on the belief that increased CO2 produces large net costs until we have considerably better reason than we now do to believe it. P.S. Bob Murphy raised the question of why I assumed that Nordhaus was giving the cost summed over the rest of the century rather than some other period. After looking through Nordhaus' webbed manuscript and a spreadsheet of his model that he sent me in response to a query by email, I think Bob is correct and I was mistaken. As best I can tell, Nordhaus is running his calculations out to 2305. If so, that has two implications. First, I was too generous in my calculation of annual cost—I should have divided by 291 instead of by 86, reducing the annual cost, in 2012 present value, to about .02% of current world GNP. Second, Nordhaus writes in his manuscript: "At the same time, we must emphasize that, based on our formal analysis of uncertainty, we have relatively little confidence in our projections beyond 2050." So it looks as though the great majority of the cost he reports is from a period for which he has little confidence in his calculations. Something he did not mention in the NY Review of Books piece I have been commenting on. A later post on the same topic. According to a commenter on my previous post, the only scenario in the current IPCC projections that results in temperature increasing by more than 2°C from now to the end of the century assumes a total consumption of coal considerably greater than the total amount believed to be recoverable. I do not know if he is correct—he links to a presentation on estimating ultimate coal production. Thinking about that claim, it occurred to me that there are (at least) two arguments for shifting from fossil fuels to recyclables, that they tend, in my experience, to be supported by the same people, and that they cut in opposite directions—the stronger one is, the weaker the other. One argument is that fossil fuels are a depletable resource that we will eventually run out of and that we should therefor be switching to non-depletable resources such as solar, wind and water. The peak oil version of this argument has been popular for quite a long time, and the same argument applies, in principle, to gas and coal. The other argument is CAGW—Catastrophic Anthropogenic Global Warming. Burning fossil fuels puts CO2 into the atmosphere which raises global temperatures and, it is argued, the increase in temperature and associated climate effects will have very bad consequences. As best I can tell, the two arguments tend to be supported by the same people. This makes sense from the point of view of someone who has a conclusion and wants arguments to support it, since both arguments support the same conclusion. It also makes sense if one sees views on such issues as largely determined by ideological allegiance, with liberals and environmentalists tending to believe in problems that require government action to solve, conservatives and libertarians tending to be skeptical. On the other hand ... . The more limited our supplies of fossil fuels are, the lower the climate effects of burning them all up. If we are going to run out of all of them by, say, 2050, then any global warming projection that depends on our continuing to burn them thereafter is impossible. To put the point differently, the closer to exhaustion we are, the higher the price of fossil fuels will be, ceteris paribus, since anyone who owns a coal mine and expects the price of coal to go up sharply as supplies are depleted has an obvious incentive to postpone production until they do. The logic of that situation was worked out in a classic article by Harold Hotelling more than seventy years ago. The higher the prices of fossil fuels, the greater the incentive to switch to renewables. If exhaustion is a serious problem, if likely rates of consumption will make fossil fuels much more expensive by, say, mid-century, the CAGW problem will take care of itself without any government action needed. Current controversies involve a series of claims about climate known with decreasing levels of certainty. 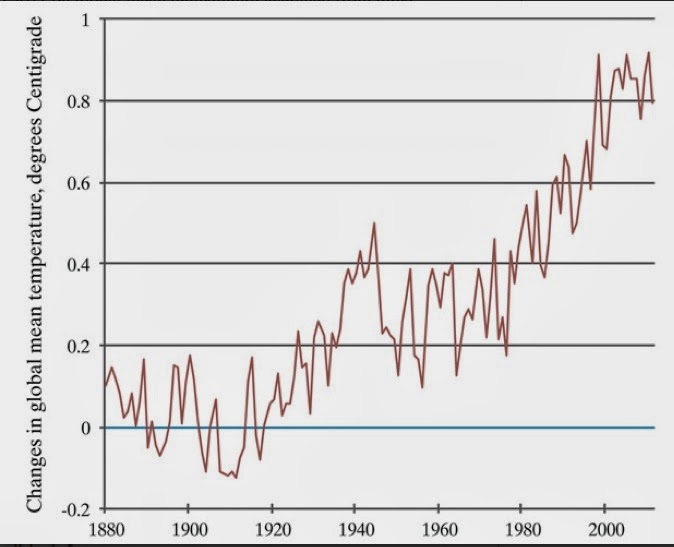 The first is that, for about the past century, global temperature has been trending up. So far as I can tell, that is well established. The second is that one cause of that increase is increased CO2 in the atmosphere due to human activity. That seems plausible as a mechanism and fits the rough pattern of what has happened. A third claim is that human activity is the main cause of current changes in earth's climate. The support for that is less clear. There have been two periods during the past century when the level of CO2 in the atmosphere has continued to rise for over a decade but surface temperatures have been close to constant. The first was from about 1940 to 1975; we are currently in the second. That suggests that there are causes sufficiently powerful, when they happen to be pushing in the other direction, to balance the effect on global temperature of increasing CO2 . The failure of global climate models to predict the current pause implies that such causes were not adequately taken account of in those models. Anthropogenic global warming is a scientific theory but it is also a publicity campaign. Central to that campaign is the claim that the science is entirely settled, hence that anyone who rejects any part of the conclusion is either ignorant or corrupt. The rhetorical strategy that supports that claim, one example of which was discussed in a previous post, consists of blurring the distinctions among the claims used to support the conclusion that unless something is done to sharply reduce world output of CO2, very bad things will happen. Anyone who criticizes any link in the chain is labeled a "denier," with the implication that he denies one or both of the most solidly supported claims—that temperatures are trending up or that humans are in part responsible. In past posts I have criticized what I regard as the weakest part of the argument, the claim that warming on the scale suggested by the IPCC models would produce large net negative effects. This post deals with a risk if the step before that is seriously wrong, if the models turn out to be much less reliable than their proponents claim. Suppose the current pause in warming continues for another twenty years. I do not believe that the attempts to explain away the current mismatch between theory and data can be successfully maintained for that long a period. If the publicity campaign to convince the public that all scientists agree with the IPCC version of truth is successful and it then becomes clear that that version was false, it will become considerably harder to persuade the public to take seriously scientific opinion in other fields. Diner: "Waiter, it says hasenpfeffer on the menu. Is it really rabbit?" Waiter: "There's a little veal in it too." Diner (still suspicious): "How much veal?" Diner: "Fifty-fifty? Just what does that mean?" Waiter. "Fifty-fifty. One of each." Inspired by my previous post.